In terms of personal injury, brain Injury is the number one killer and disabler of Canadians under the age of 40 years old. 50,000 Canadians sustain brain injuries each year, and incidence rates are rising. Motor Vehicle Accidents (MVA) account for more than 50% of the brain injuries. Our personal support workers (PSWs) who care for clients with personal injury and Acquired Brain Injury (ABI) have undergone the Brain Basics training from the Ontario Brain Injury Association (OBIA). From this training, our PSWs can appreciate the consequences of ABI unto the lives of the victims and their families. The Brain Basics training also teaches our PSWs practical strategies to work effectively with people living with the effects of ABI. Brian injury is complex, and the approaches to helping a survivor are also complex. Our Retire-At-Home Services case manager in Toronto has undergone the Brain Injury Family Intervention (BIFI) training, a whole-family intervention designed to satiate the complex needs of families after brain injury. Founded on cognitive behavioral and family systems counseling theories, the BIFI promotes effective coping strategies for families experiencing significant emotional and behavioral changes post-injury, with the flexibility to consider the uniqueness of the needs of each family. 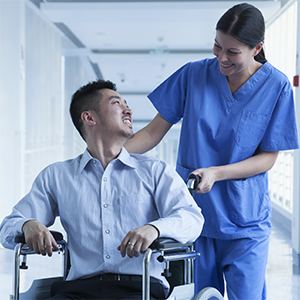 You are in good hands with Retire-At-Home Services’ Personal Injury Care. Call us today to see how we can help your client or loved one.